I know the title of this post is weird enough to make you people think that i might have gone crazy. But don’t worry, I’m perfectly fit and fine. 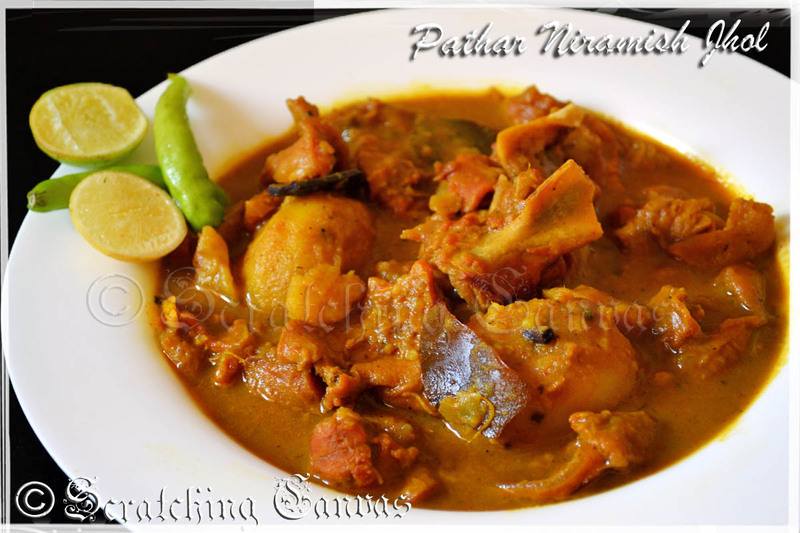 I’m actually very happy to announce that I have finally cooked Veg Mutton Curry or Pathar Niramish Jhol just before this Kali Puja (Diwali). When the entire nation celebrates Diwali, Bengalis worship Goddess Kali. This festival has few very unique rituals which differentiates Kali Puja from rest of the Hindu festivals. This puja starts mostly on late night and continues through out the night. At some places Tantric activities and animal sacrifices are done to please goddess Kali. Since these days animal sacrifice is considered to be cruel and inhuman, many places practice sweet or even vegetable sacrifices to keep the ritual alive. Only on this Hindu festival alcohol is used and consumed as Prasad. The meat of the sacrificial animal/ sweet/ veggies and alcohol are the two core ingredients of this puja to please goddess Kali. These are considered as bhog and after the puja they are distributed among the devotees as Prasad. Anyways my post is not about Kali Puja and it’s rituals. It is all about the cooking process of the sacrificial goat. As the animal is sacrificed to the Goddess and the bhog is prepared with the meat of the sacrificial animal, it is considered as ‘Veg’ item and it can’t be combined or cooked with any non-veg items like onion, garlic etc (Don’t be surprised. Bengalis do consider onion and garlic as non-veg items). This recipe is actually not mine. The original recipe belongs to a Kali bari near my mother’s place. There they still sacrifice goat and vegetables on the day of Kali puja and cook the meat of the goat and serve it to the non-vegetarian devotees while bhog cooked from sacrificial vegetables is served to the vegetarian devotees with some Bengali sweet pulao. When first time I had this bhog I was a little kid. I had no idea about anything except whether the food is tasty or not. But I could not imagine tastier mutton than this. 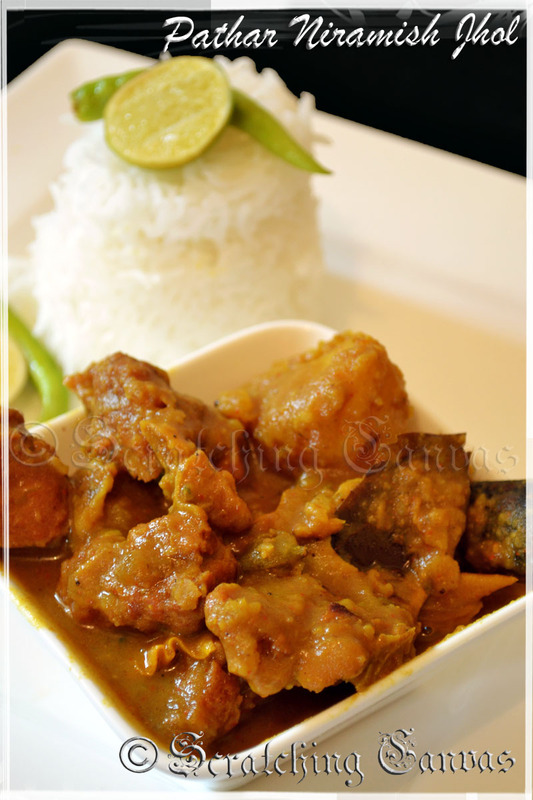 Even I requested my mom few times to make that kalibari wala mangsho with pulao on few occasions. And my magic maker mom sneaked out the recipe and made it few times at home for her little princes. 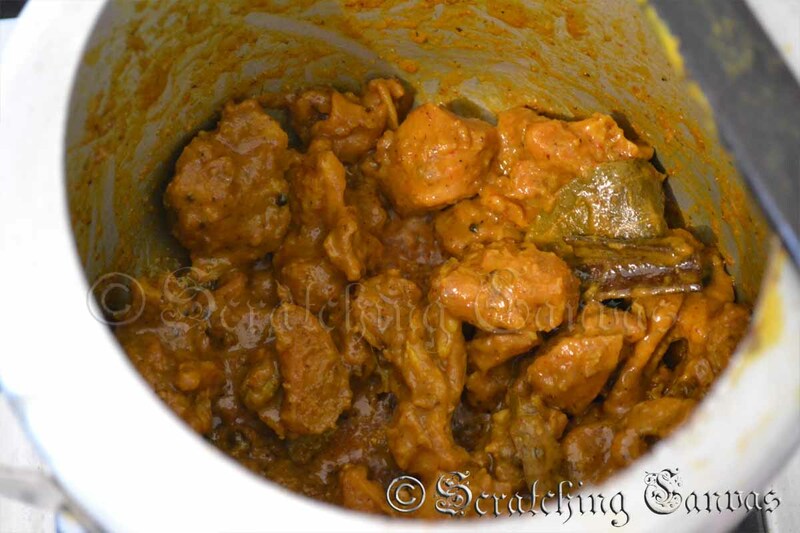 Even i had this plain and simple mutton curry few times on its own during high fever or any other sickness. During this sort of situations our taste buds become so numb that we don’t like to eat simple food, we crave for some spicy or tangy stuff to bring back the sensation of taste. But on the other hand doctors always prescribe simple and light food which are easy to digest. 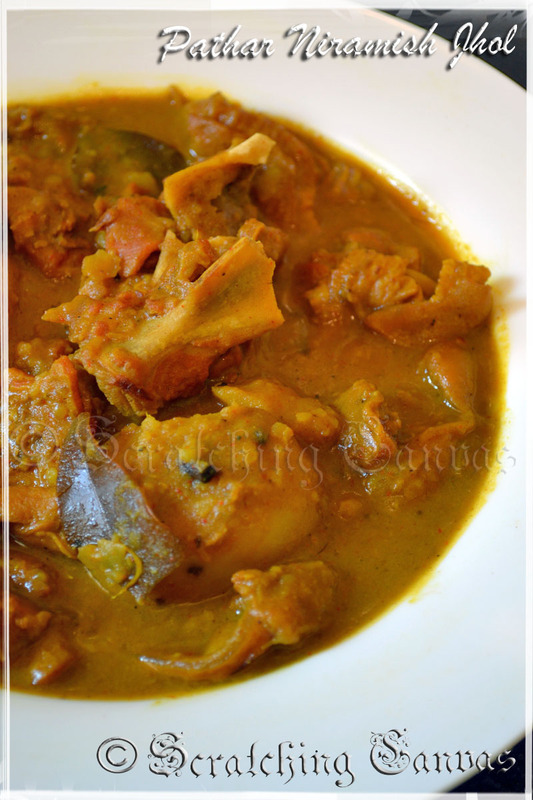 As this recipe doesn’t need any onion or garlic it is very light and spice free. So you can also enjoy this type of food while you are in a mood of light food. When this week everybody was waiting for the Diwali celebration around my place I was actually missing Kali Puja of my mother’s place. Even more I was craving for that bhog. And I knew I needed that homely touch to enlighten my mood before Diwali. So I called up my mother the day before and noted down the recipe. Though I had no time to make sweet pulao I overjoyed the veg mutton over simple steamed white rice. 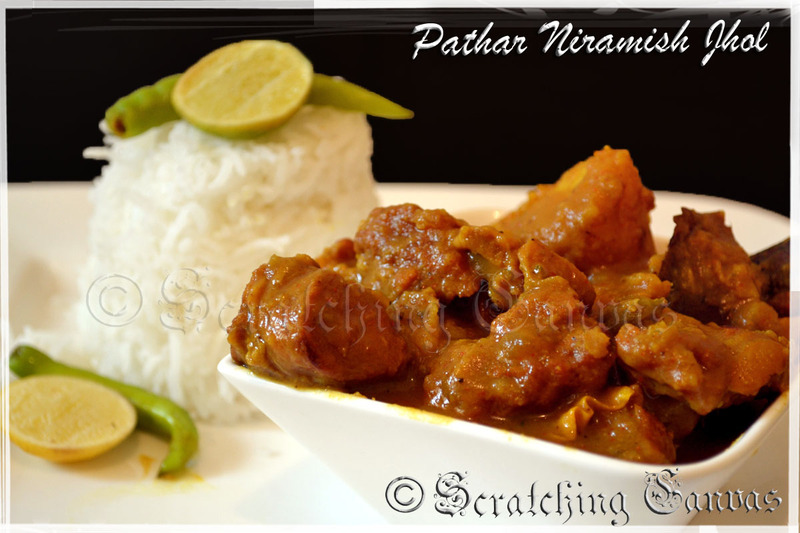 Pathar mangsho (goat meat): 500 gms. Wash and clean the mutton thoroughly. Cut off the fat if possible. Reserve the mutton in a large bowl. 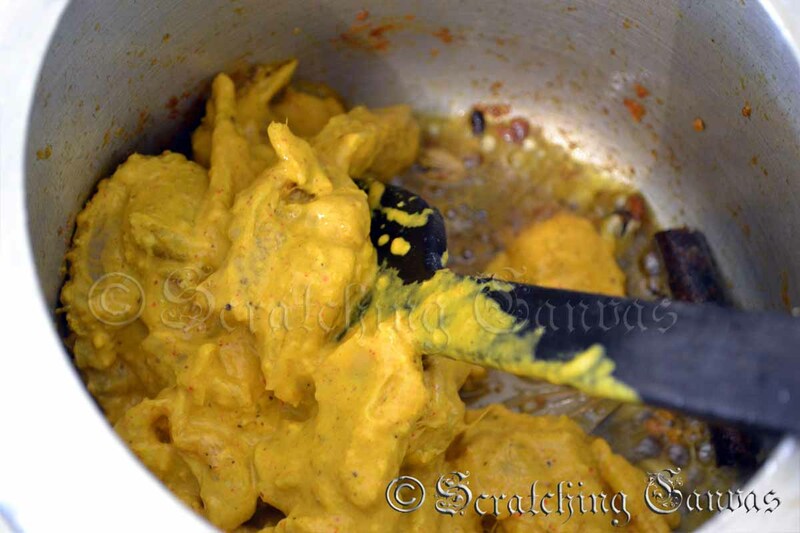 Smear the mutton with half of the turmeric and salt and keep aside for 10-15 mins. Take curd in a small bowl. Add ginger paste, red chilli powder, coriander powder, cumin powder and beat well. Make sure no lumps are there. Add cinnamon powder and cardamom powder and again beat well. 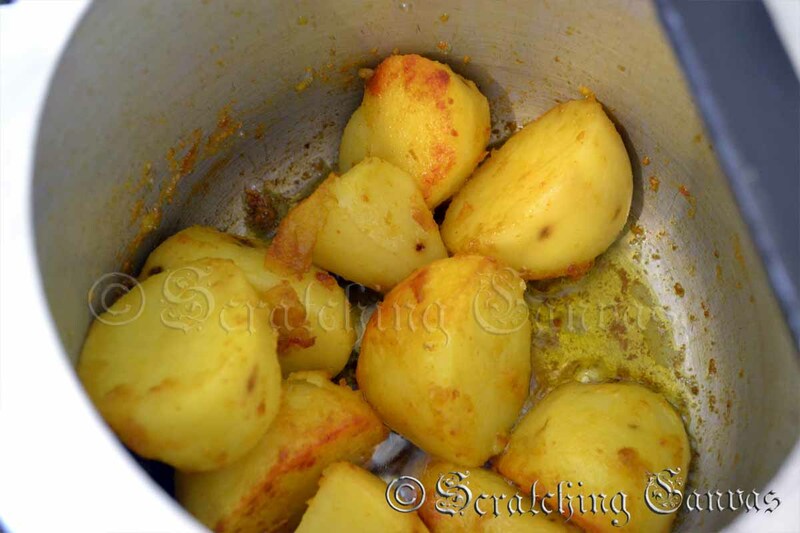 In the meanwhile, heat oil in a pressure cooker on high flame and fry potatoes with a pinch of salt and turmeric until potatoes are golden brown in color. Remove the potatoes and keep them on paper towels. Add more oil if needed and add ingredients for tempering oil. Let them splutter. Add remaining ginger and saite for 1 min. Shake off all the marinade from mutton pieces and add them in to the pressure cooker. Don’t throw away the marinade. You will need them later. Stir in between to avoid burning. When you reach to this kind of consistency simmer the flame. Add potatoes and water. Use high flame to bring it to boil. Cover the lid with the weight and wait for 7-8 whistles. Adjust seasoning. 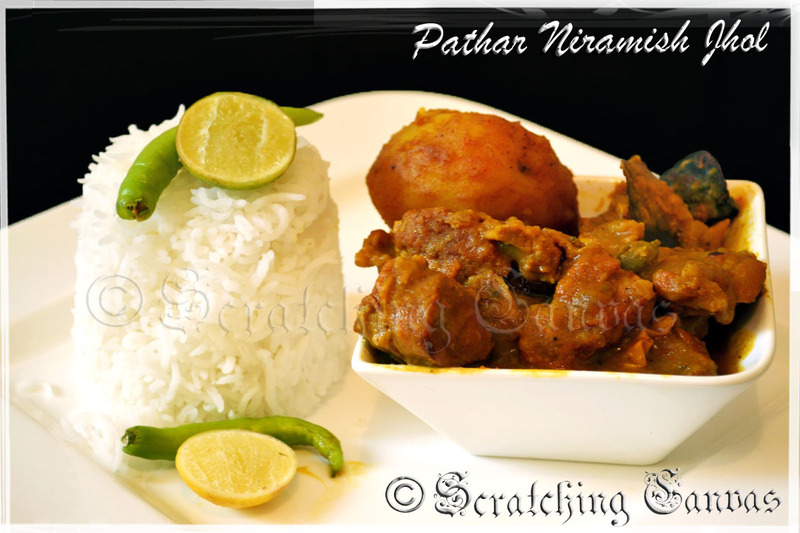 Pathar niramish jhol is ready to be served with Bengali Mishti Pulao (yellow sweet pulao) or piping hot steamed rice. 1. 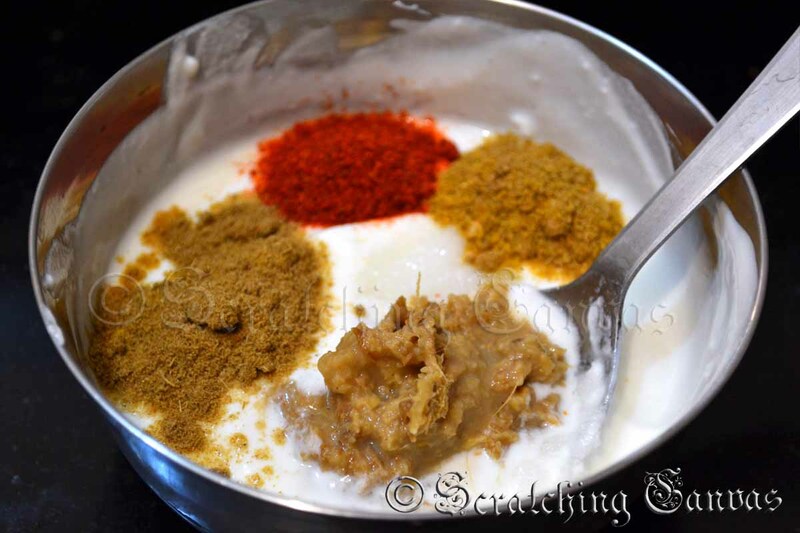 It is very important to use hung curd for this recipe. 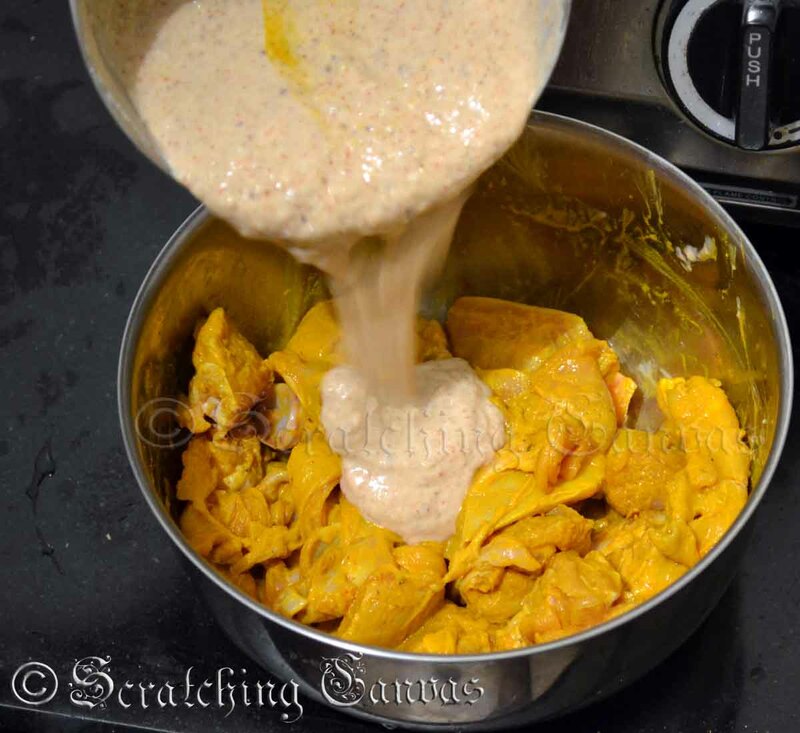 if you use regular curd it will add water content to the mutton which will wash away the flavors while marinating. Hang the curd for 30-45 mins to drain the water completely. It will have moisture but won’t be runny. 2. 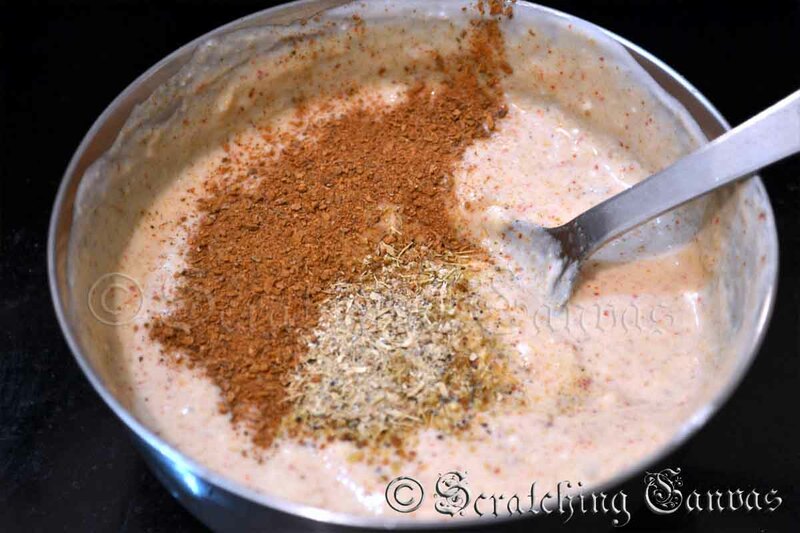 As we are not using any masala for this recipe I used some Kashmiri red chilli powder to get a rich reddish look. 3. Here the sugar is not used for the sweetness. For regular mutton curry we use onion. 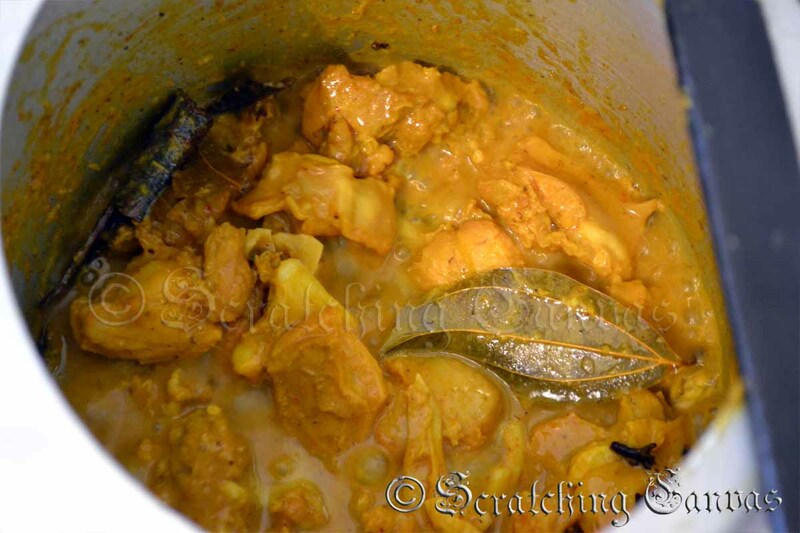 While frying the onion natural sweetness is added to the curry from it. As we are avoiding onion here, we need little sugar to balance the taste of the curry. 4. 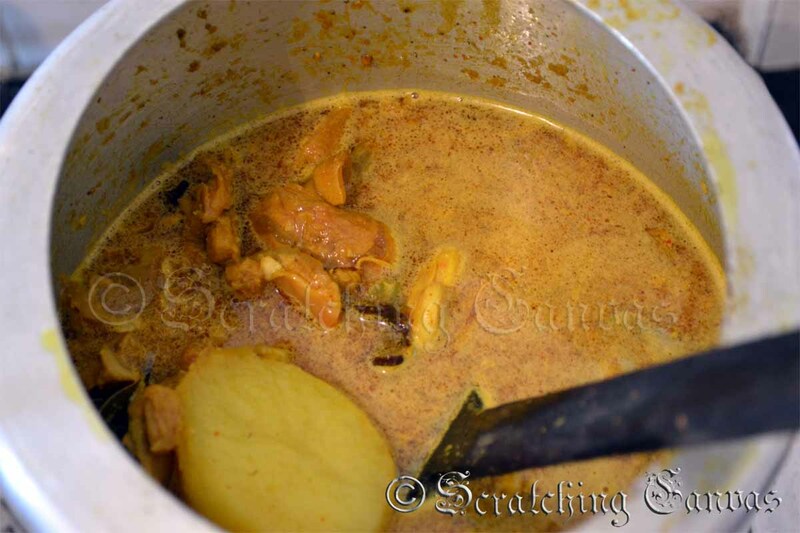 As we are going to make this curry on pressure cooker no need to marinade it for long. Even you can marinade for 30 mins. 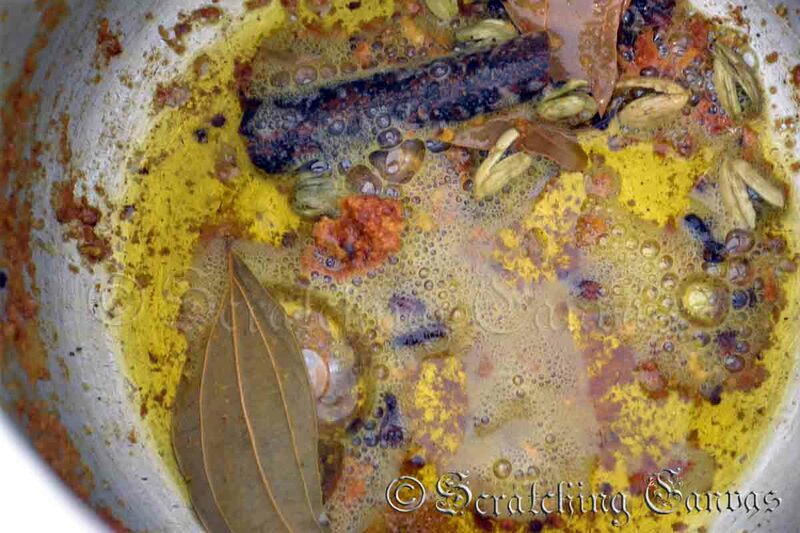 But not less than that as the mutton needs at-least 20-30 mins to absorb the flavors. 5. Don’t over fry the mutton. It will harden the mutton pieces and final product will become chewy and rubbery. 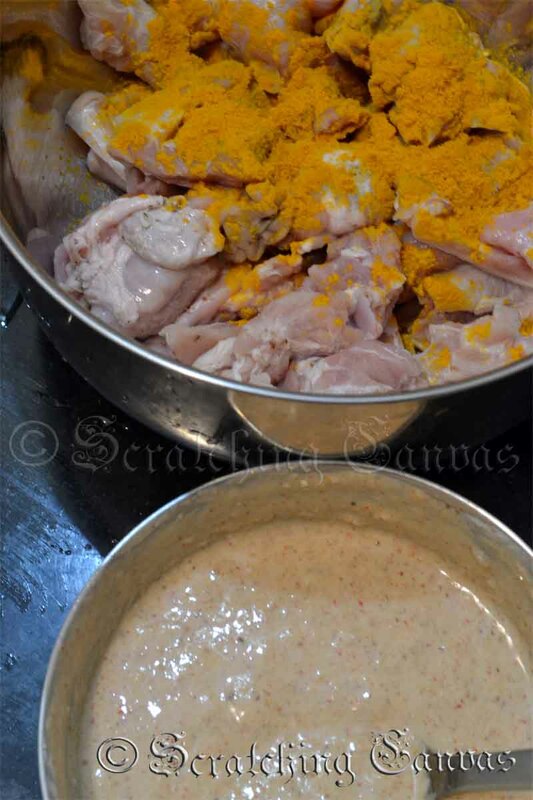 But what about the excess marinade portion which was told to keep aside for later use as thats not mentioned anywhare….. what to do with it later on??? It's my bad that I had missed it. 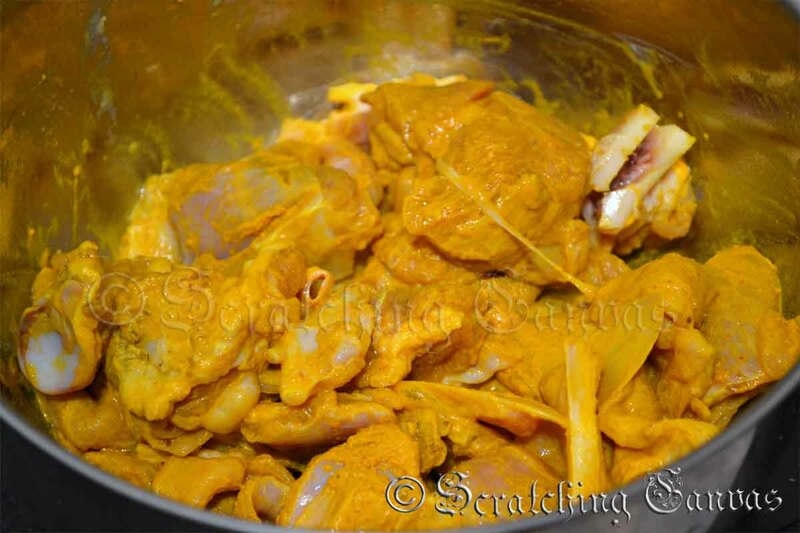 Add the marinade just right after browning the mutton and fry until it turns golden brown.